Oh they were very "vocal". They've been criticizing Trump since March of 2017 on our immigration issue. Every alert, every memo, every article, press release, interview, post etc. cost Republicans thousands of votes in this electiono and collectively millions. When someone tells you day after day that your new President is a "liar", a "betrayer", a "broken promises" "narcissist" "fraud" "scammer", a lot of people actually believe it and think "well, I'm not going to vote then" or "I'll vote for a DemoQuack, at least they're ""honest"" about it." Remember that meme? A tragic defeat for our country. I don't think people understand the significance of what has happened yet or the dire consequences that will result from it. Last edited by Judy; 11-08-2018 at 07:38 PM. Don't forget to post the new 78 page rule in the Federal Register. It's a 30 day comment period before the new rule can even go into effect. Maybe the Proclamation can go into effect immediately under a national emergency for national security. Can't wait until tomorrow. President Donald Trump says asylum seekers must go to ports of entry in order to make a claim. US apparently, have ordinary constitutional rights. I have not devoted my life to studying th constitution but I know there are plenty of individuals in conservative circles who have! Can't we put our heads together and beat the ACLU? We don't violate the rights---apparently--when legal immigrants get deported for crimes of moral turpitude. Are we supposed to have less lax standards for refugees and/or illegal immigrants. A lot of these families amount to international enterprises---they are third or fourth generation bricklayers, masons, autobody fixers, mechanics, corn pickers. etc---gonna send some of the profits back home! What about our international commerce clause? And what do other countries do, that have a similar constitutional structure? Do illegal immigrants enjoy full citizenship rights? In other words==What the H--- is going on? The White House announced Thursday that migrants who try crossing the border illegally won't be able to claim asylum, in an attempt to crack down on "meritless" claims. The rule, which prevents migrants from claiming asylum if they do not do so at an official border crossing, is the latest attempt by the White House to handle a surge in migration to the U.S. from the Central American countries of Guatemala, Honduras and El Salvador. President Trump is expected to formally enact the rule in a presidential proclamation Friday and will invoke the same powers he used to push through a version of the travel ban that was upheld by the Supreme Court, according to senior administration officials. A senior administration official said the White House hopes that by funneling asylum claimants to ports of entry, officials will be able to assess and adjudicate the claims more rapidly. The official did not say where asylum-seekers would be housed should they arrive at those ports of entry in large numbers. The official added that the rule was not retroactive and only covers future asylum claimants. According to DHS, the department has seen a 2,000 percent increase since 2013 in migrants claiming that they have "credible fear" of persecution should they return to their home country. In 2017, the U.S. fielded more than 330,000 asylum claims, nearly double the number two years earlier and surpassing Germany as highest in the world. A senior administration official said Thursday that the vast majority of such claims are "non-meritorious." Administration officials said those denied asylum under the proclamation may be eligible for similar forms of protection if they fear returning to their countries, though they would be subject to a tougher threshold. Those forms of protection include "withholding of removal" -- which is similar to asylum, but doesn't allow for green cards or bringing families -- or asylum under the United Nations Convention Against Torture. The rule change is likely to be challenged in court. Omar Jadwat, director of the American Civil Liberties Union's Immigrants' Rights Project, said they were clearly illegal. Curbing immigration has been a signature issue for Trump, who pushed it hard in the days leading up to Tuesday's midterm elections, railing against caravans of Central American migrants that are still hundreds of miles from the border. As of Thursday, there are more than 5,600 U.S. troops deployed to the border mission, with about 550 actually working on the border in Texas. The military is expected to have the vast majority of the more than 7,000 troops planned for the mission deployed by Monday, and that number could grow. Trump has also suggested he'd revoke the right to citizenship for babies born to non-U.S. citizens on American soil and erect massive "tent cities" to detain migrants. Those issues were not addressed by the regulations Thursday. The administration has long said immigration officials are drowning in asylum cases partly because people falsely claim asylum and then live in the U.S. with work permits. Trump has long said those seeking asylum should come through legal ports of entry. But many migrants are unaware of that guidance, and official border crossings have grown clogged. It's unclear how many people en route to the U.S. will even make it to the border. About 4,800 migrants are sheltered in a sports complex in Mexico City, some 600 miles from the U.S. border. 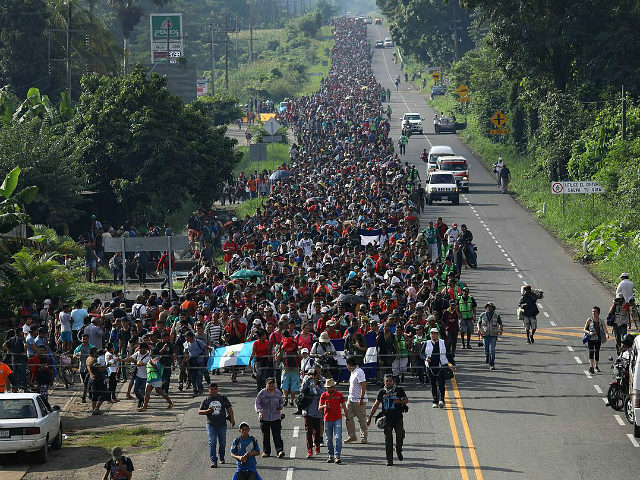 Several smaller groups were trailing hundreds of miles to the south; officials estimated about 7,000 in all were in the country in the caravans. The migrants are largely poor people and many say they're fleeing violence; more than 1,700 were children under 18, and more than 300 were children under age 5. Fox News' Jake Gibson and Kelly Chernenkoff and The Associated Press contributed to this report. Jeff Sessions probably has done all that can pretty much be done to close what loopholes could be closed through policy changes. Furthermore, I'm sure Sessions was heavily involved in this new roll-out, not Whitaker, who just took control yesterday. Any more that needs done will probably require changes in law. As for Whitaker, he was primarily hired by Trump in an attempt to offer him and/or his family member's, Don Jr. & Kushner, protection & cover regarding the Russian collusion investigation. Trump needed a yes man and he seems to have found one. Let's not lose sight of the fact that Trump's hiring of Whitaker has little to do with immigration and everything to do with the Russian collusion probe. Furthermore, I'm sure Sessions was heavily involved in this new roll-out, not Whitaker, who just took control yesterday. November 6, 2018 . . .